I’ve just returned from a stellar 13-day journey aboard a Viking River cruise, along with 189 fellow passengers plus crew. The Viking Truvor (formerly the Sergey Kirov) is a three-level ship built in Germany and is based in St. Petersburg, Russia; Truvor translates to “our faithful”. 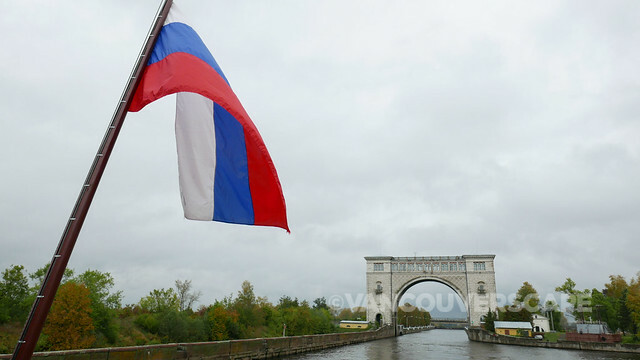 Russia, the world’s largest country, takes up an eighth of the world’s surface, borders 14 different countries, 12 oceans and seas and spans 11 time zones. 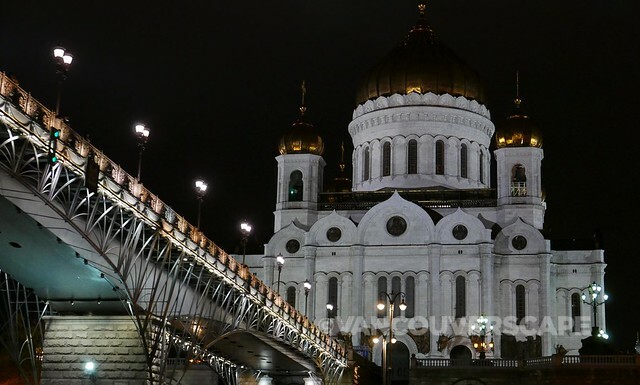 Here is my journey in photos, from St. Petersburg to Moscow (seven ports of call). Our first few days are spent in St. Petersburg, docked on the Neva River. We make our way to the city from the port via bus. 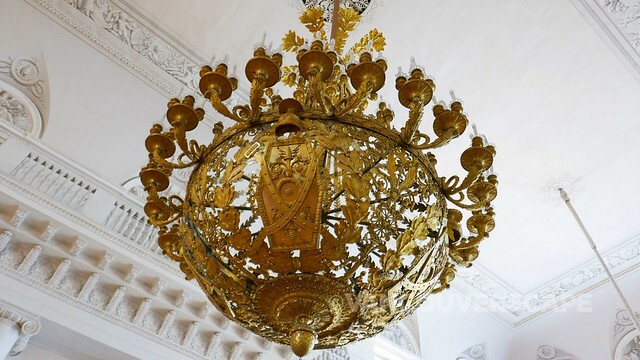 Once through Hermitage security, one of the first impressive eyefuls is the French Baroque grand staircase. 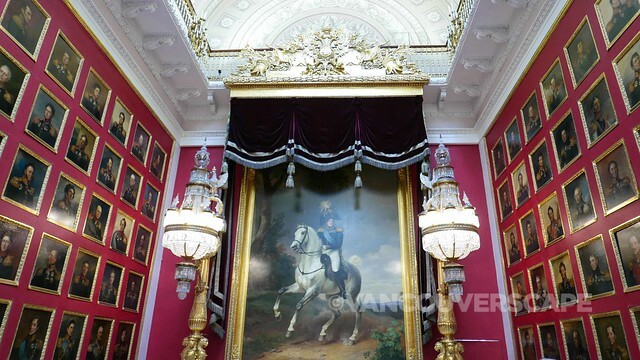 Upstairs, the chandelier inside Neoclassic Field Marshall Hall is the heaviest in the palace. 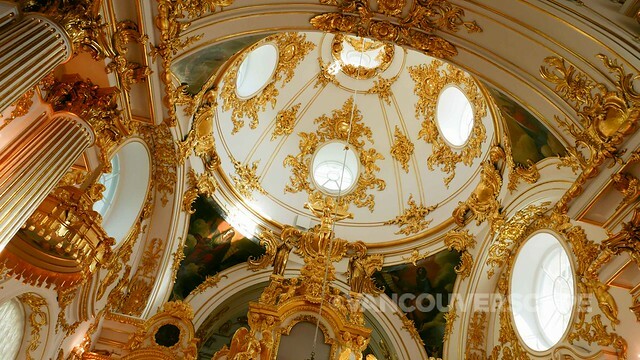 Gilded gold columns inside the Emblem Hall and costumes showing off aristocratic fashion and opulence continue to amaze. 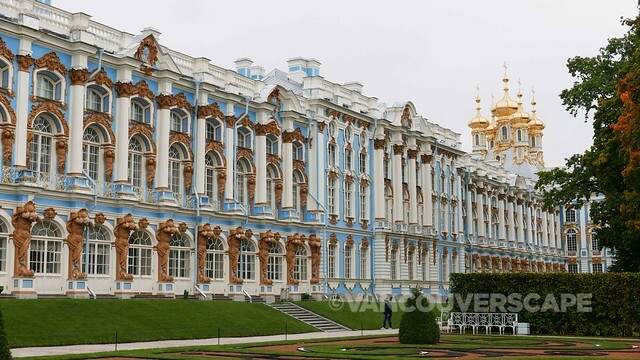 Catherine Palace in Pushkin is another highlight. We got a great glimpse of the 300-year-old city as we cruised along its canals one afternoon. After three nights docked in St. Petersburg, it’s time to set sail and head along the Neva. 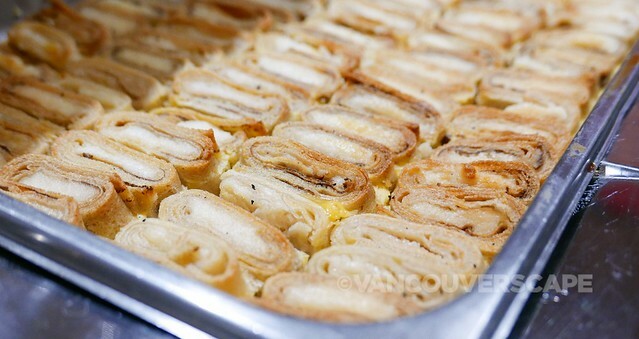 At 7 pm, we toast with the crew and fellow passengers as our boat begins to leave the pier. Mandrogy was destroyed during World War II and disappeared from maps for years to follow. 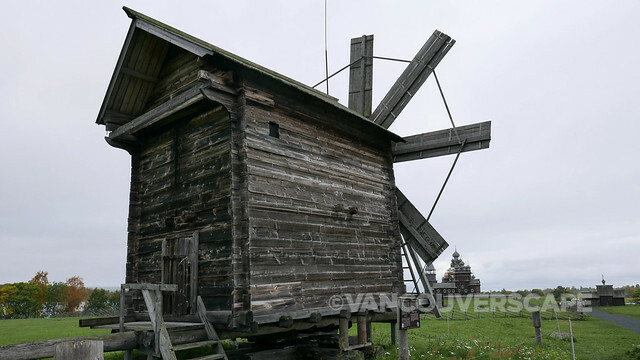 In 1996, enterprising Russian Sergei Gutzeit rebuilt Mandrogy as an open air museum, filled with brightly painted wooden houses, windmills, vodka and bread museums plus numerous artisans. 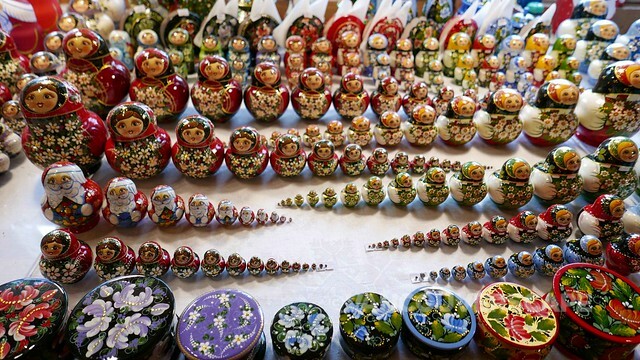 I signed up for an optional matryoshka doll-painting workshop. According to legend, matryoshka dolls didn’t originate here but were inspired by a doll from Honshu, Japan over 100 years ago. 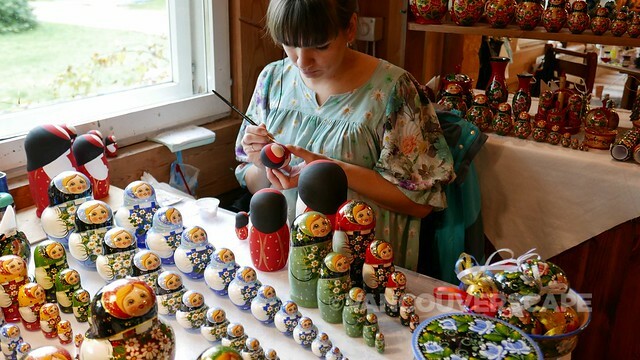 Traditionally, one artisan carves the dolls while another paints them. We got to paint a set of three and enjoyed some Russian pastries and tea served in the adjacent room of a heritage house in the village. During the night we leave the Svir River area and by morning, my first views of Lake Onega come into view. The lake’s brownish tint contains a high mineral content that provides nutrients for over 40 species of fish (including freshwater salmon, trout and whitefish). I’m already getting excited about tonight’s dinner prospects! 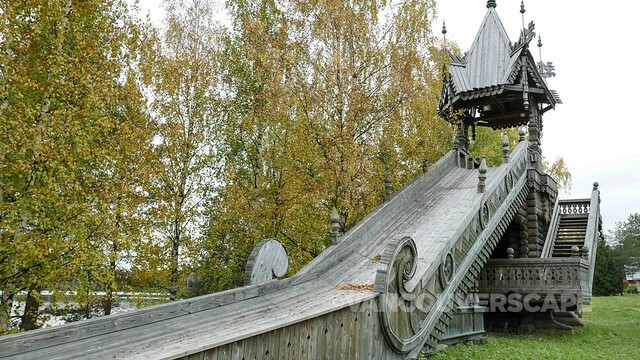 We arrive in Kizhi for a morning tour of its open air museum of architecture. 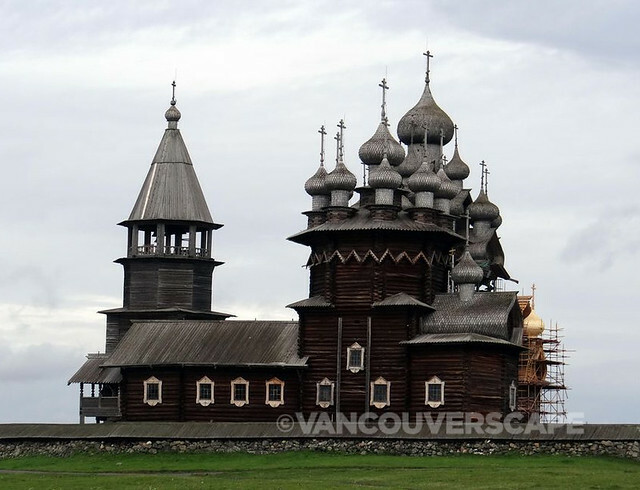 This collection of historic structures were moved here from various regions of Russia for preservation; today it’s a UNESCO World Heritage Site. 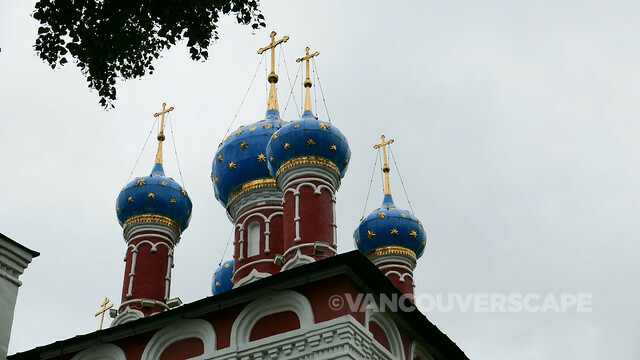 The Transfiguration Church and its series of cool onion domes is the island’s big draw. 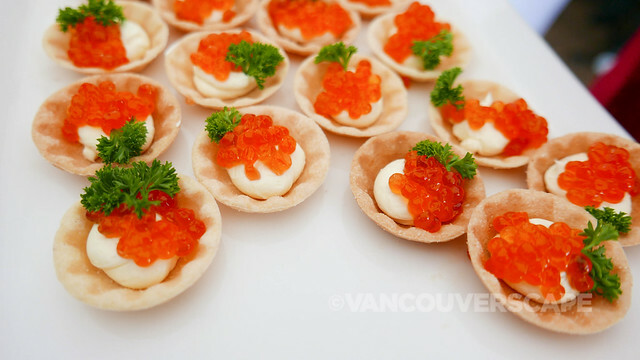 Back on ship, we’re treated to an awesome view of it all and enjoy a little party on the Sun Deck with champagne and caviar on crackers as we cast off again at 10:30 am, because there’s never a bad time for champagne, nyet? 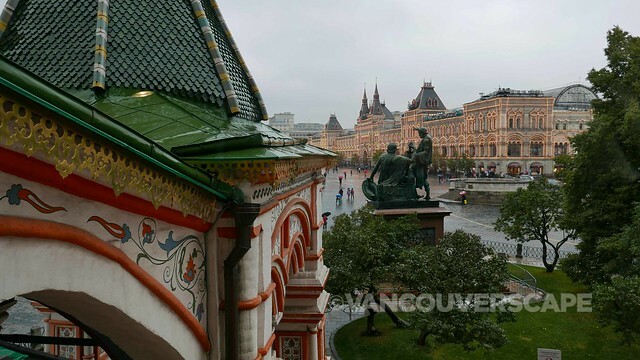 As we’re sailing for the remainder of the day, there’s a variety of stuff to do on board: a Russian lesson, Captain’s deck tour, tea and cakes in the Panorama Bar and a Romanov Dynasty lecture. 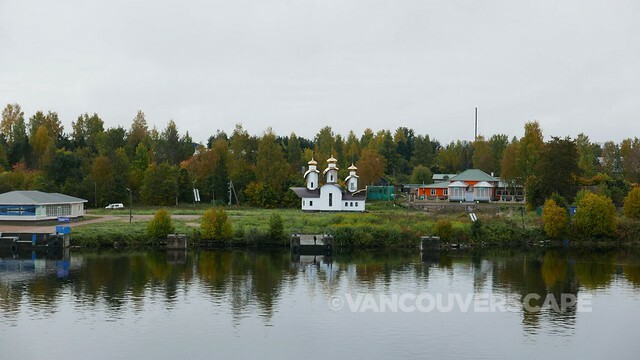 We arrive in Kuzino and board busses to the village of Kirillo for a visit to the Kirillo-Beloersky Monastery on the shores of Lake Siverskoye. 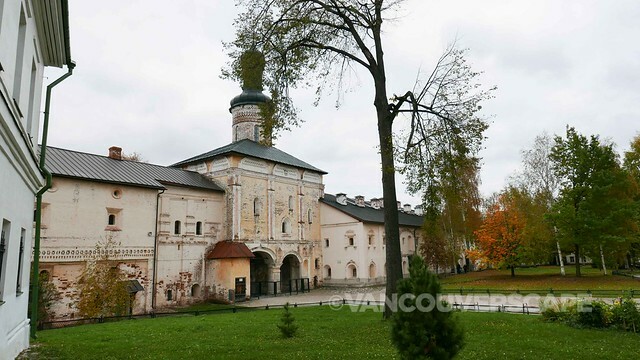 In its heyday, this impressive structure was considered the largest monastery in Russia with 11 churches dating to the 15th through 17th centuries, containing an amazing array of world-renowned icons and frescoes. 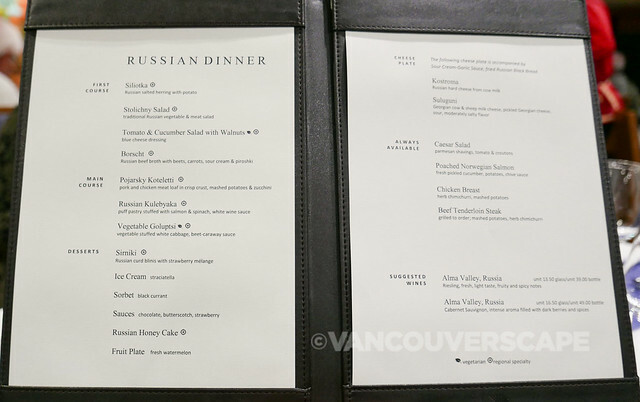 On the dinner menu that night are Russian dishes and later in the evening, I’m off to sample vodka in the Panorama Bar. 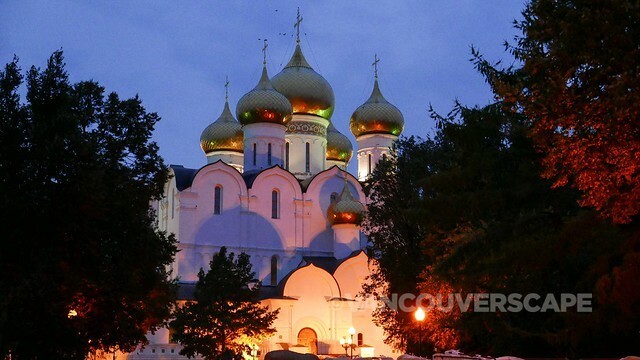 From my veranda, I’m treated to ever-changing views of sweet little churches and small villages before arriving at the 1,007-year-old Golden Ring city of Yaroslavl, my favourite city on the trip. 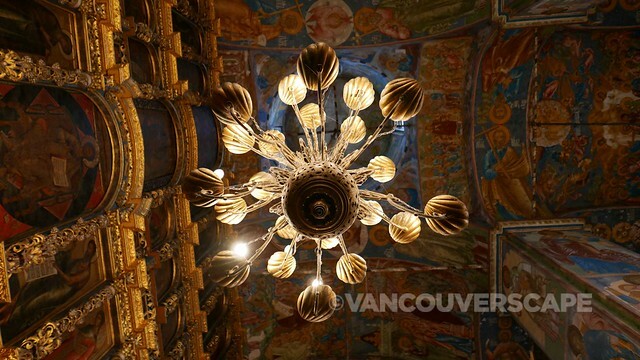 We took a three-hour walking tour of its compact, picturesque center, stopping inside the Church of St. Elijah the Prophet to admire the colourful, ornately decorated ceilings and frescoes. Our last stop is at golden-domed Cathedral of Transfiguration, completed in time for the city’s 1,000th anniversary celebration in 2010. 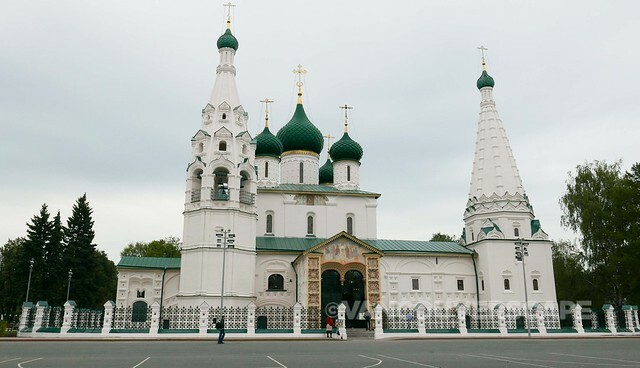 One of Russia’s wealthiest men donated over $100 million to build this new cathedral on the site of its predecessor that was destroyed by the Soviets. We get to enjoy Yaroslavl at dusk when the lights begin to shine on its architectural gems, including this old Soviet-era building. 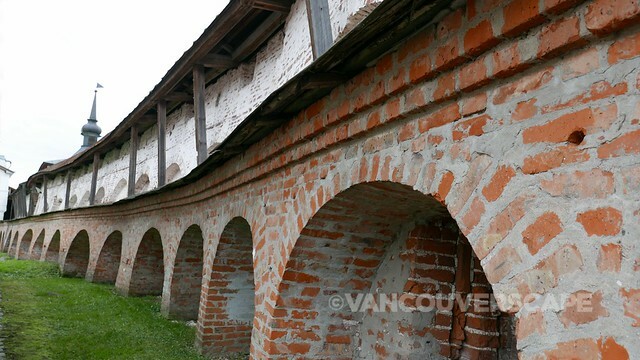 We arrive at the village of Uglich, a cute little town on the river founded in 1148. 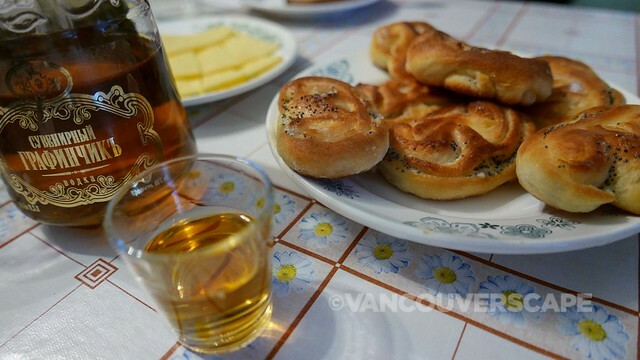 After a visit to colourful Church of St. Dmitry on the Blood, we’re hosted by a local family for homemade vodka, Russian pastries and tea and learn about Russian life through culture, sport and economy. 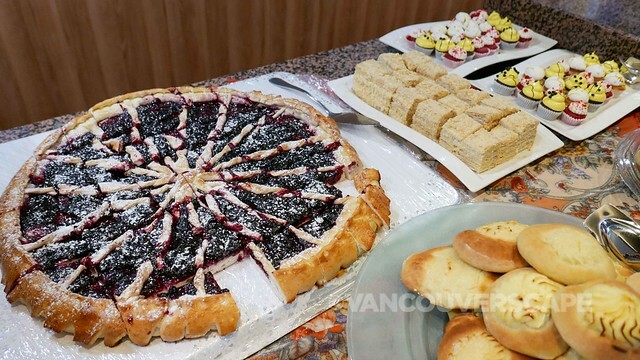 Back on board, lunch is a Russian feast, complete with Russian beer and a decadent assortment of desserts. The afternoon talk focuses on Putin and Medvedev. The Captain’s reception and farewell dinner is our last full evening aboard the ship before arriving in Moscow with three full days of touring before our cruise ends. Tomorrow we’ll be docked near a lovely park, about a 15-minute walk to the closest metro station. After cruising along the 127-km, man-made Moscow Canal, we’re in the capital. This amazing metropolis houses 2,500 historical and architectural monuments. 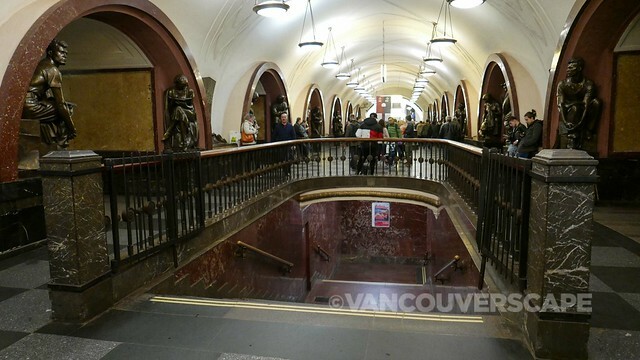 The start of our day-long tour takes in a couple of gorgeous metro stations (Mayakovskaya, Ploshchad Revolyutsii). 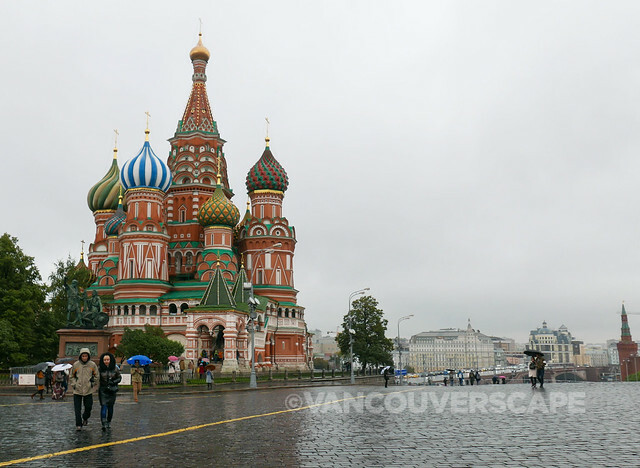 On this cool, rainy October Friday afternoon, Red Square is still busy with tourists. 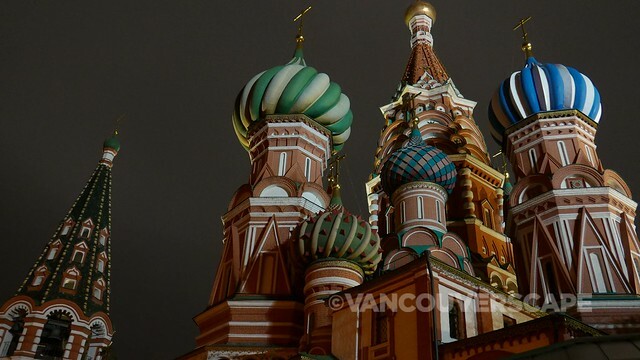 The creme-de-la-creme St. Basil’s Cathedral delights in its beautiful colours, right next to The Kremlin and uber department store GUM (pronounced GUUM). 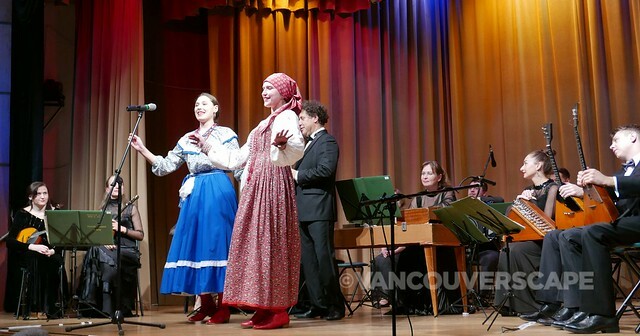 In the early evening, our entire ship is treated to a private concert by Moskva Orchestra, with bayan, guslie, domra and balalaika musicians performing a variety of pieces. 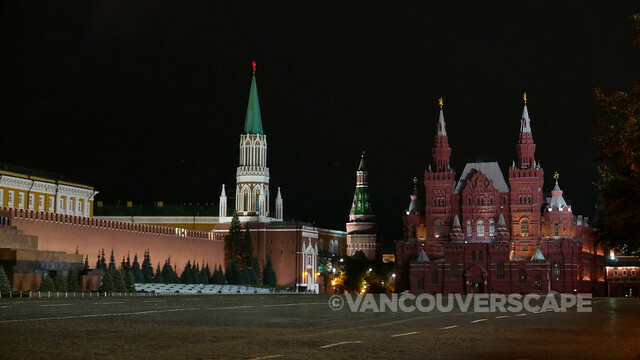 The next couple of days are spent touring The Kremlin, Cosmonaut Museum, Jewish Museum and a night tour by boat. 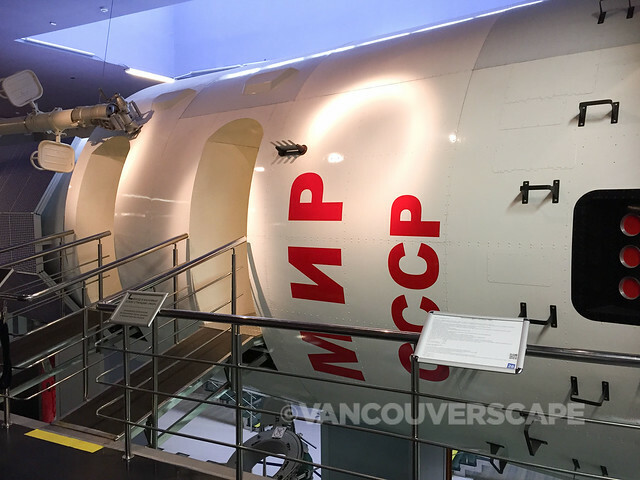 It’s a packed few days but there are enough tours to choose from to enjoy three days in Moscow. My earlier post outlines the exact itinerary and route map. 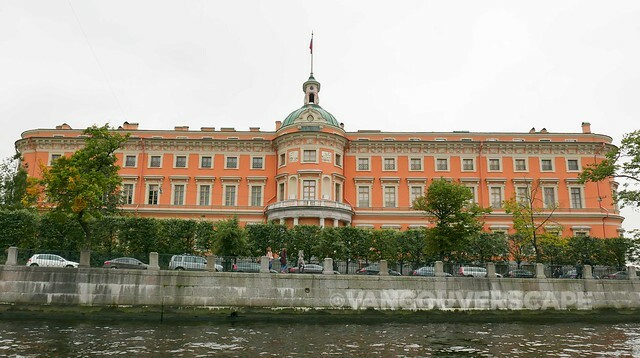 I was a guest aboard Viking’s Waterways of the Tsars sailing. Opinions, as always, are my own.